Michigan is the 10th most populous and the 11th largest state in the US. The state is the center of the automotive industry in the country. Michigan is located in the Great Lakes and mid-western regions of the USA. Michigan means "large lake" or "large water", the word Michigan is the French form of the mishigamaa (Ojibwa word). The official flag of Michigan has a blue background with the Coat of arms of Michigan that has a shield which consists of a man with a gun which represents that people have the ability to stand for their rights. The bald eagle and other prominent animals of Michigan also find their place on the flag. The map of Michigan shows the Midwestern state being bordered by four of the Great Lakes – Lake Superior, Michigan, Huron, and Erie. Motown Museum in Detroit, Potter Park Zoo in the capital city of Lansing, and the Michigan Theater are among the popular attractions in Michigan that are shown on the map. Apart from Federal and state highways, important cities such as Jackson, Grand Rapids and Bay City are also clearly depicted. Nearby airports and national forests are also denoted on the map. Situated in the Great Lakes and Midwestern regions of the US, Michigan is also known as the Wolverine state; however, the animal is rarely found in the state. Michigan is the 11th largest state in the country in terms of area and the 10th most populated state comprising 9.928 million people as of 2016. The capital of Michigan is Lansing, while its largest city is Detroit. Michigan consists of 83 counties. Prior to the arrival of the Europeans in Michigan, the region was inhabited by the native American tribes. The Algonquian people, who were the most populous, consisted of people from the following tribes: the Anishinaabe groups of Ojibwe, Odaawaa/Odawa (Ottawa), and the Boodewaadamii/Bodéwadmi (Potawatomi). In 1622, the Europeans began to settle in the region and by 1688, the first permanent European settlement was established. In 1679, Fort Miami was built by the French explorer Robert Cavelier, Sieur de la Salle at the place which is today known as St. Joseph. In 1691, a trading post and Fort St. Joseph were established by the French. It was located along the St. Joseph River what is now known as the city of Niles. Michigan was under French rule; however, the Treaty of Paris signed in 1763 placed the state under the British. Michigan played a prominent role during the American Revolutionary War and during this period, Detroit was an important supply center of the British. Following the end of the war, British control continued over Michigan and Detroit and in 1791, the states became a part of Kent County in Upper Canada. However, in 1796, according to the Jay Treaty, Britain gave Detroit and some other posts in Michigan to the US. In 1805, the Michigan Territory was established and Detroit became its seat of Government. In 1837, it was admitted as a free state into the Union and in 1847 the state capital was moved from Detroit to Lansing township. Michigan is spread over an area of 96,716 square miles. 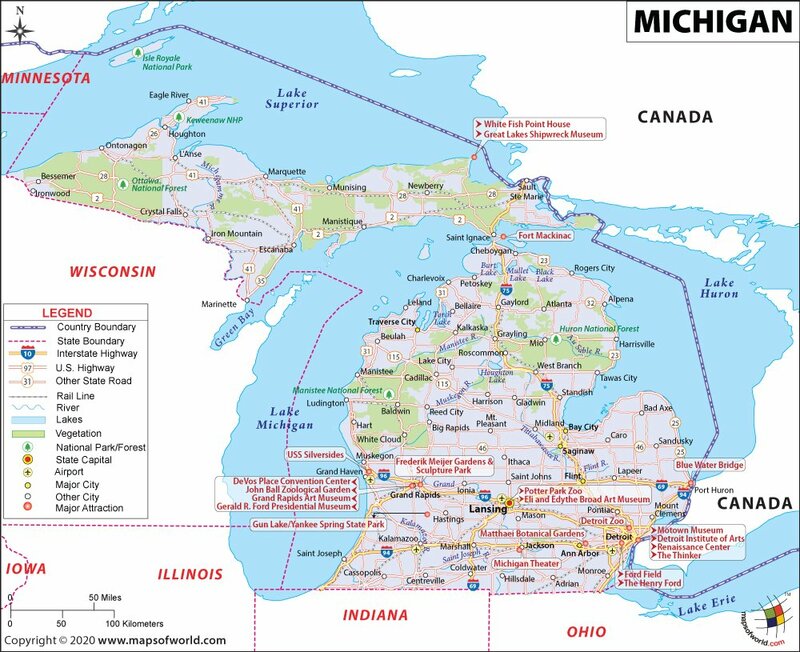 Michigan shares its borders with the US states of Indiana, Ohio, Wisconsin and Ontario, a Canadian province. The state also shares a water boundary with the two US states of Minnesota and Illinois. Other than this, Lake Superior, Lake Huron and Lake Michigan also border the state. Michigan comprises of the Upper and Lower Peninsula. While the Upper Peninsula is heavily forested, the lower peninsula is shaped in the form of a mitten. Mount Arvon, which rises to a height of 1,979 feet, is the highest point in the state, while Lake Erie at 571 feet is the lowest point in the state. Some prominent large islands in the state are North Manitou and South Manitou, Beaver, Fox and Isle Royale among others. Some principal state rivers are the Detroit River, St. Marys River, and St. Clair River. Michigan has a continental climate. The Pictured Rocks National Lakeshore is a must-see destination and is noted for its exquisite landscape. A visit to Colonial Michilimackinac in Mackinaw City would take you back in time. A French fur-trading village and military outpost in the 18th century, the village was destroyed in 1781 when it was burned. Here you would get the highlights of British occupation and era of American Revolution. The Michigan Historical Museum, located in Lansing, throws light on the history of Michigan from the prehistoric times to the 1990s. Other places worth visiting are State Capitol, Mackinac Island, Isle Royale National Park, Pictured Rocks National Seashore, Mackinac Bridge, among others. Michigan is well-connected by air, rail and road. The largest airport in the state is The Detroit Metropolitan Wayne County Airport, followed by The Gerald R. Ford International Airport in Grand Rapids. The third largest airport in Michigan is Flint Bishop International Airport. The four Class I railroads that service Michigan include: the Canadian National Railway, the Canadian Pacific Railway, CSX Transportation, and the Norfolk Southern Railway. Other than this, many southern and western cities in Michigan are connected to Chicago in Illinois by the Amtrak. Some important highways that pass through the state are I-75, I-69, I-94 and I-96. Michigan has a well-established education system with myriads of private universities and colleges. Some prominent universities are Central Michigan University, University of Michigan, Michigan State University, Michigan Technological University, Oakland University, Wayne State University, and Western Michigan University. Michigan is the only state in the country that consists of two peninsulas – Lower and Upper peninsula. Detroit, Michigan's largest city, is also known as the car capital of the world.